I make work about temporal processes and forms. 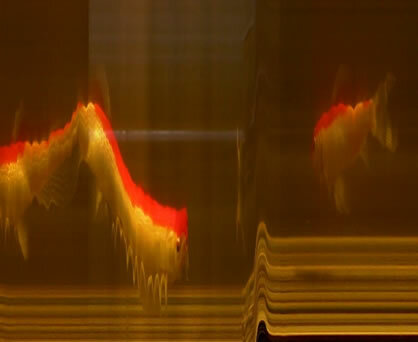 In this piece (transversions), time based processes in the pattern of fish swimming and the rise and fall of waves are made apparent in reinterpreted video. The technique used can be described as follows: a video is treated as a three dimensional block of color information with the depth of the block equivalent to time, the height and width individual frames. This box is slicing this box different angle to generate a new frame. In appearance stationary objects in the frame become a line, and moving objects become strange patterns and distortions that grow and disappear. The webpage http://libarynth.fo.am/cgi-bin/view/Libarynth/TimeCube has a nice diagram of the process. This work relates to my fascination with time, with natural phenomena, with unexplained mysterious occurrences, with my obsession of making apparent the invisible or barely perceived.